The guided-missile destroyer USS Lassen (DDG 82) is underway in the Pacific Ocean. The U.S. Navy’s Freedom of Navigation Program is an important expression of international law. The U.S. Freedom of Navigation (FON) Program has recently drawn significant attention in the United States and the international community. During this period of focused attention, some observers have questioned the legality of U.S. FONOPs. This author has previously outlined the legality and legitimacy of the U.S. FON Program, including FONOPs conducted as part of that program. 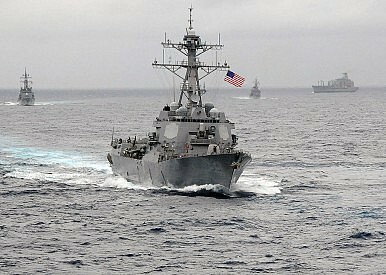 Other observers have also questioned the appropriateness and wisdom of U.S. FONOPs, particularly in the South China Sea. A prime example would be a recent critique by Dr. Sam Bateman of Australia, in which he alleged that U.S. FONOPs in the South China Sea “don’t make sense.” This followed a similar piece that he published in June 2015. Although Dr. Bateman asks some valid questions about the ongoing South China Sea situation, he makes incorrect assumptions on several points about U.S. FONOPs and misses the mark on several others. Below is an attempt to set the record straight on the matter, based upon this author’s prior experience with the U.S. FON Program at the operational, theater, and policy levels of the U.S. military. In Dr. Bateman’s analysis of the South China Sea situation, he understandably turns on a spotlight calling for clarity, but he unfortunately aims that spotlight in the wrong direction. Specifically, he complains, “It’s not clear just what the Washington is protesting in the South China Sea.” To be sure, lack of clarity is a component of this complex South China Sea problem, and this author has previously argued that greater clarity could help to improve the overall South China Sea situation. However, the need for greater clarity begins not with Washington, but with the claimant states – and particularly with Beijing. Curiously, Dr. Bateman has been able to accomplish something that those foreign governments, international tribunal, and expert observers have been unable to do. In February 2014, Dr. Bateman criticized the congressional testimony of U.S. Assistant Secretary of State Daniel Russel, saying that Russel demonstrated a “lack of understanding” of what China’s U-shaped line is. Specifically, Dr. Bateman said the U-shaped line is a “loose geographical shorthand to say we claim islands and features, it is not actually questioning other countries who have established exclusive economic zones inside the nine dash line, or indeed have maritime boundaries with their neighbor.” While this might be what Dr. Bateman presumes it to mean, there is no record of official declaration or documentation issued by China to support his interpretation. Moreover, the practice of international law does not operate by “loose geographic shorthand” for establishing territorial and maritime claims. In addition, China has not clarified the specific nature of the geographic features that it is claiming in the South China Sea or the maritime zones to which China asserts those features are entitled, to include those for which it has recently undertaken reclamation (i.e., enhancement to naturally-formed areas of land) and “clamation” (i.e., construction of artificial islands on low-tide elevations and submerged features). Time and time again, China’s official representatives have said only that China has “indisputable sovereignty over the Nansha [Spratly] Islands and their adjacent waters.” But China has never clarified which South China Sea features are islands entitled to an exclusive economic zone (EEZ), which features are rocks entitled to only a territorial sea, and which features are artificial islands warranting only the maximum of a 500-meter safety zone. While China declared in its 1992 territorial sea law that it would employ straight baselines for its entire coastline and all of its islands, it has never drawn or published baselines for any of the features in the Spratly Island group, as it would be required to under Article 16 of UNCLOS. And even after the United States conducted FONOPs this week, China remained ambiguous in the specific nature of the geographic features within the Spratlys and maritime zones around those features that it is claiming. Washington has attempted to be clear on many of the matters involving the South China Sea situation, and might very well need to be clearer on other aspects in the future. But Dr. Bateman should also call upon Beijing to officially clarify what exactly it is claiming in the South China Sea and provide its basis under international law for making those claims. Dr. Bateman also assumes that U.S. FON operations might be intended to “protest against China’s claim to sovereignty over disputed features.” Such an argument oversimplifies the South China Sea situation, which is a textbook example of a complex problem of international relations involving geographic disputes. The reality is that the South China Sea situation involves several categories of international disputes: (1) competing territorial claims, (2) overlapping and competing maritime claims, and (3) excessive maritime claims. More pertinent to Dr. Bateman’s incorrect assumption, it is important to understand the different categories of disputes in the South China Sea because different U.S. national policies apply to the complex situation simultaneously. For competing territorial claims to which the United States is not a party, the U.S. policy is that it generally does not take a side on which claimant state has sovereignty of the territory, but instead calls upon the claimants to resolve the disputes by peaceful means. At the same time, for excessive maritime claims, the longstanding U.S. FON policy applies. What about in situations when multiple coastal states claim sovereignty of the same geographic feature but only one of them asserts an excessive maritime claim around the feature? Once again, the United States focuses on challenging the excessive maritime claim, without taking sides on the competing sovereignty claims. In the nearby East China Sea, the Senkaku Islands are a situation of that nature. China (which calls them the Diaoyutai) and Japan both claim sovereignty of those geographic features. Although Japan has drawn straight baselines along parts of its mainland coast, several of which the United States views as excessive, Japan has not asserted any excessive maritime claims in the waters around the Senkakus. By contrast, in September 2012, China improperly drew straight baselines around them. As part of the U.S. FON Program, the United States issued a demarché in March 2013 to China, challenging those improper baselines around the Senkakus. The demarché stated, “The United States takes no position on the ultimate sovereignty of the Senkaku Islands. Irrespective of sovereignty claims, international law does not permit the drawing of straight baselines around these features.” Likewise, any U.S. FONOP in the vicinity of the Senkakus would challenge that excessive maritime claim without taking sides on the issue of competing sovereignty claims to the features themselves. On the specific issue of U.S. FONOPs around the (re)claimed features in the South China Sea, this author commends the recent effort by Shannon Tiezzi to deconstruct the complicated issue of what those particular FONOPs would actually be challenging. Dr. Bateman also assumes that the United States will conduct “FON operations against only China’s claims” in the South China Sea. But that assumption is also incorrect. The U.S. FON Program does not discriminate against states – it focuses on the claims that individual states assert. The program challenges the excessive nature of those maritime claims, regardless of the nature of the relationship between the United States that the coastal state asserting the claim. In fact, a review of the annual FON reports proves that the United States routinely challenges excessive maritime claims asserted by allies, partners, competitors, and potential adversaries alike. For decades, the U.S. government has diplomatically and operationally challenged excessive maritime claims that are asserted by coastal states in every region of the world. These include U.S. challenges to excessive maritime claims asserted by several of the states bordering the South China Sea. In fact, before the U.S. FON Program was officially established in the late 1970s, the United States diplomatically protested an excessive maritime claim asserted by the Republic of the Philippines in 1961. A review of the annual DoD Freedom of Navigation reports reveals that U.S. FON operations in recent years have consistently been conducted without discrimination against excessive maritime claims asserted not only by China, but also by Malaysia, the Philippines, Taiwan, and Vietnam. Given this history of the U.S. FON Program, it would be reasonable to assume that the United States will continue to challenge those excessive claims in the future. The only difference is that the United States will likely challenge fewer claims asserted by some of those coastal states, particularly the Philippines and Vietnam. But that is not because the United States is taking sides or discriminating in favor of one claimant or against another. Rather it is because those two states have enacted national maritime laws over the past several years (Philippines in 2009, Vietnam in 2012) that successfully reformed some of their longstanding excessive maritime claims to conform to international law. Thus, whether the United States will challenge maritime claims in the region depends more whether China and the other claimant states maintain or reform their excessive maritime claims. Dr. Bateman also unfairly characterizes U.S. FONOPs as “deliberate provocations.” Presumably, he is alleging that the U.S. government intends to provoke a response from a coastal State. Yet he provides no evidence to support this assertion. As discussed previously, U.S. FONOPs – like the other elements of the U.S. FON Program – are deliberate in nature. That is, they are thoroughly planned, legally reviewed, properly approved, and professionally conducted. But they are not intended to provoke. Instead, they are intended to demonstrate U.S. non-acquiescence in excessive maritime claims asserted by other states. Acquiescence is not some new concept, but rather is a long-standing and well-established principle of international law. When it comes to the issue of provocation, Dr. Bateman is once again turning on a useful spotlight, but aiming that spotlight in the wrong direction. Whose deliberate action is the original source eliciting reactions by other states? It is the coastal state who decides to enact a maritime claim that attempts to deny or restrict freedom of the seas guaranteed to other states. For example, China has enacted a national law that restricts the right of innocent passage of foreign ships through its territorial sea. Yet Article 24 of UNCLOS expressly states that a coastal State may not “impose requirements on foreign ships which have the practical effect of denying or impairing the right of innocent passage.” Given that clear rule of international law, what recourse do other states have? Some states might remain silent, for a number of reasons. But it is more foreseeable that other states, such as the United States, would challenge that unilateral action by a coastal state, through diplomatic protests and operational transits. In that sense, the excessive maritime claim is the deliberate action that elicits a response from others. Dr. Bateman also accuses the United States of “trying to turn back the clock on the carefully balanced EEZ regime” in UNCLOS. Presumably, he intends for this comment to be a criticism of the U.S. legal position or approach. However, as a non-lawyer who frequently opines on matters involving international law, Dr. Bateman might not realize that that is exactly what a state should do in the proper application of international law: rely upon the original text and the negotiating history of a treaty in order to maintain the integrity of the rules of law reflected in that treaty. International law, as reflected in the Vienna Convention on the Law of Treaties, outlines the established methodology for states to interpret and apply treaties. Specifically, that body of law requires states to interpret a treaty in accordance with the “ordinary meaning” of its terms, in “their context,” and in “light of the treaty’s object and purpose.” That body of international law also recognizes, if a particular provision of a treaty is “ambiguous or obscure,” then states may consult supplementary means of interpretation, including the negotiating history of the treaty. Likewise, states are not allowed to reinterpret the rules of law of a treaty contrary to their ordinary meaning, take them out of context, or ignore the treaty’s object, purpose, and negotiating history. In addition, the text of UNCLOS requires that an “innocent” passage must refrain from a list of 12 specific activities that are “prejudicial to the security of the coastal State” (Art. 19). Among the prohibited activities is a vessel engaging in any threat or use of force, collecting information against the coastal state, or interfering with the coastal state’s communication systems. Despite the exhaustive nature of this specific list of prohibited activities, Dr. Bateman suggests that the mere “sending” of foreign warships through the territorial sea of another state “could be a breach of innocent passage.” The theory he posits is revolutionary in nature and would effectually invalidate the list in Article 19 of the treaty. Yet, once again, he fails to explain where his personal preference is codified into international law. As a factual matter, he also provides no evidence to show that U.S. forces have engaged in any of the 12 prohibited activities while conducting U.S. FONOPs to preserve the right of innocent passage. In short, the insinuation is legally and factually baseless. One of Dr. Bateman’s most illogical assertions is his attempt to differentiate China’s recent transit through the U.S. territorial sea around the Aleutian Islands near Alaska from the U.S. FONOPs conducted near the (re)claimed features in the South China Sea. Specifically, he argues, “Whereas sending ships patrolling into another country’s territorial sea specifically to demonstrate a right of passage could be a breach of innocent passage, the Chinese ships were on a direct passage.” As a factual matter, Dr. Bateman’s explanation ignores the reality that China’s navy had concluded a maritime exercise with Russian forces in the days preceding the innocent passage, and China’s transiting warships had to go significantly out of their way thereafter to conduct what Dr. Bateman characterizes as a “direct passage.” More importantly, it ignores the political reality that China’s view of international law might be in the process of evolving, at least when it comes to oceans outside of East Asia. Over the past decade, however, a rising China with growing interests around the world has slowly approached a maritime dilemma: Would China continue to view itself purely as a coastal state vulnerable to external threats? Or would it embrace the importance of preserving the freedom of the seas in order to better protect its expanding interests? Notwithstanding Dr. Bateman’s prediction ten years ago, China’s recent actions at sea strongly suggest that it has chosen “maximum” maritime freedom, at least when it means freedom for the oceans located in the maritime zones of other states. It is an uncontroverted fact that China’s navy, over the past several years, has repeatedly conducted military activities in the EEZs of the United States (around Guam and Hawaii), Japan, the Philippines, Malaysia, Indonesia, and India. At the same time, China’s warships have exercised the right of innocent passage through the territorial seas of a number of nations, including the United States. When questioned about those activities and transits by the People’s Liberation Army Navy, Chinese officials have not denied their occurrence. Speaking of which, Dr. Bateman appears to have accepted some of China’s legal rhetoric at face value. A recurring example of such rhetoric is when Dr. Bateman mentions that “China has repeatedly denied it poses such a threat [to Freedom of Navigation].” Yet one should be cautious about accepting such verbal denials, and instead consider both China’s words and its actions as a coastal state. Over the past two decades, China has enacted one of the most comprehensive legal regimes of excessive maritime claims by any coastal state in the world. China has improperly drawn straight baselines along its entire mainland coast, even though UNCLOS allows the use of such baselines in exceptional situations only. China has drawn straight baselines around the Paracel Islands and the Senkaku Islands, even though UNCLOS recognizes that right for archipelagic states only. China restricts foreign warships’ right of innocent passage through its territorial sea, even though UNCLOS guarantees that right to all ships. China has imposed a security restriction in its contiguous zone, even though UNCLOS allows enforcement of four limited categories of national laws only (i.e., fiscal, immigration, sanitation, and customs). And China restricts foreign activities in its exclusive economic zone, even though UNCLOS established the EEZ to protect resource-related “sovereign rights.” While a number of coastal states in the world have asserted one or two of these categories of excessive maritime claims, China is one of only seven coastal states in the entire world that has a “full house” of excessive maritime claims affecting the freedom of the seas guaranteed to other states in each of its maritime zones. Worse, China’s legal regime of excessive maritime claims is one that is trending in the wrong direction. Some coastal states might make the argument that their excessive maritime claims are simply legacy statutes that pre-date their ratification of UNCLOS and are no longer enforced. But China has continued to create new excessive maritime claims in recent years, such as its improper straight baselines around the Senkaku Islands in 2012 and an overbroad East China Sea air defense identification zone in 2013. Thus, notwithstanding China’s verbal assurances, China’s legislative enactments and other actions do not reassure the United States and other states that China does not pose a threat to the freedom of the seas in the waters and airspace of East Asia, including those located in the South China Sea. The most troubling point made by Dr. Bateman is how he attempts to minimize what is at stake when it comes to China’s excessive maritime claims. Specifically, he says, “It’s a fairly trifling issue on which to risk a dangerous incident between Chinese and American forces.” This is not a trifling matter, but a significant one. The body of law reflected in UNCLOS is a deliberate balance of interests between coastal states and user states. It must be respected globally. It must be followed consistently. In this context, acquiescence to actions by any coastal state that are intended to impair the freedom of the seas codified in UNCLOS is not an acceptable option. Non-acquiescence is the underlying tenet of the U.S. FON Program, including FONOPs conducted under that program. Will this fundamental and universal regime of international law be allowed to unravel to suit the desires of one state? If this regime of international law is allowed to be contorted by unilateral desires of any one state, what regime of international law will be at risk next? This is no “trifling issue,” Dr. Bateman. Much is at stake. China’s policies in the region have created a dangerous mess, and an ironic one.